In press (DOI:10.1016/j.molstruc.2012.05.016) in the Journal Of Molecular Structure (Volume 1023, 12 September 2012, Pages 212-215) in the special issue: MOLECULAR VIBRATIONS AND STRUCTURES: THEORY AND EXPERIMENT â€” A collection of papers dedicated to Professor Jaan Laane on the occasion of his 70th birthday. This paper on the “actual” geometry of -annulene is part of several larger stories addressing a larger polyene (or larger-polyene) issue. 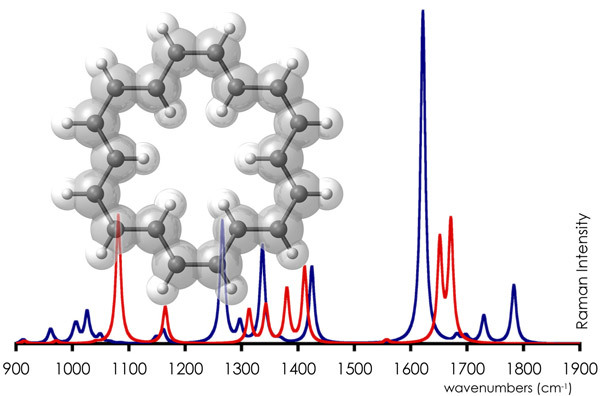 First among these is the meaning of experimental results obtained by various spectroscopic methods (in this case, using previous X-ray, Raman (with the C2 (blue) and D6h (red) simulated spectra shown in the image above), IR, and NMR data that produce different results within the limitations of the methods to study the single molecule). Second is the quality of the theoretical method for reproducing certain types of spectroscopic data. In the case of the [N]-annulene series, the ever-present B3LYP density functional is found to produce the time-average geometry of -annulene found in X-ray data, but another density functional (in this case, KMLYP), finds that bond-alternate minima exist. Third is the importance of the zero-point level in the treatment of systems for which bond-alternate geometries exist with transition-state barriers calculated to be below the zero-point level in the classical approximation of nuclear positions (the Born-Oppenheimer Approximation). NOTE 2: Optimization and Frequency calculations must be performed as TWO SEPARATE CALCULATIONS. The iop-called density functional does not carry itself over between opt + freq (or other properties) in the same input file. If you opt + freq in the same input file, you will Opt with KMLYP but freq with BLYP. This will be obvious by the number of imaginary modes. Abstract. -annulene has been of great interest from the structural point of view of its bond alternation. High-level calculations based on structures selected for agreement with NMR spectra lead to a bond-alternate C2 form over a non-alternating planar D6h structure deduced from diffraction, infrared (IR) and electronic spectral studies. Here it is shown that computed Raman spectra for the D6h and C2 forms are expected to be very different. However, two equivalent non-D6h bond-alternate minima of D3h or C2 geometries are separated by only a small barrier along a motion that involves CC stretching and compression. It is shown here that the zero-point level is above the barrier for this species. In light of that fact, the NMR calculations are reconsidered with inclusion of zero-point level averaging.